BMW Assist Advanced eCall is an automatic emergency call system which predicts the likely severity of occupants’ injuries. 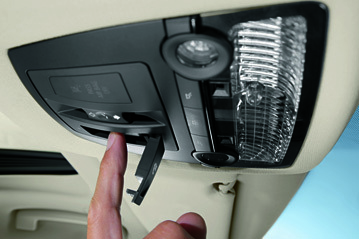 It forms part of “BMW Assist”, a safety and convenience option available on all BMWs which also incorporates information and roadside assistance services. If crash sensors detect that a vehicle has been involved in an accident, Advanced eCall automatically contacts a BMW call centre and provides detailed information about the accident: its precise location, the number of front-seat occupants, the crash severity and direction, the number of deployed airbags, seat belt status and, in BMWs with rollover sensing, whether a rollover has occurred. Uniquely, Advanced eCall also predicts the risk of severe injury using a knowledge-based algorithm known as URGENCY, which takes the above crash parameters into account. In the event of an accident, a SMS message is sent to a BMW call centre, giving all of the critical information; the URGENCY severity risk prediction is based on this data. In addition, a direct voice link is established between the vehicle and the call centre. Information which the car occupants can provide verbally, along with the detailed SMS data, is used by the call centre to determine the most appropriate emergency response. If the car occupants are unconscious or otherwise unable to communicate, the emergency services are automatically notified of the accident. Advanced eCall can also be manually activated if needed. The system scans all available mobile networks to try to contact the call centre. A machine-to-machine (M2M) SIM-Chip is soldered into the Advanced eCall module and is much more robust than conventional SIM card readers. Although Advanced eCall can be bought only by BMW customers in some countries, it can be used in most parts of Europe where there is adequate GSM coverage. In all cases, the emergency services of the country in which the accident has occurred are contacted by the call centre. BMW expects that, by predicting the severity of injuries, the best and most appropriate emergency action can be taken by the emergency services: helicopters can be used if appropriate, and casualties can be taken directly to the trauma centre best suited to deal with the likely injuries. In this way, it is expected that injuries can be treated most effectively and emergency services can make most efficient use of their resources. In accidents involving a fatality, around a third of mortalities occur within the first ten minutes. BMW Advanced eCall cannot help these people. However, of the remaining two thirds, currently around half of the mortalities occur within 90 minutes of the accident and the other half at a time later than that. Advanced eCall has the potential to assist these two groups by delivering faster, and better focussed, emergency assistance. While it is anticipated that Advanced eCall will benefit low severity injuries, its primary focus is on severe and fatal injuries, especially in remote areas. Broader use of mobile phones means that occupants who have only minor injuries are increasingly able to notify the emergency services of the accident. It is estimated that, if all cars were equipped with an emergency call system, some 2500 lives could be saved every year in Europe and the number of people severely injured reduced by 10-15 percent. It is anticipated that, by using URGENCY to predict the likely severity of injuries, BMW Advanced eCall might be able to save an additional 1500 lives a year, if all cars had such a system and if emergency services were able to make full use of the additional information. BMW Assist Advanced eCall is a subscription service at present. A certain period of subscription is included in the price of the option. Thereafter, an annual subscription must be paid in order to maintain the service. If the subscription is not maintained, Advanced eCall will still make an emergency ‘112’ call in case of an accident where not legally restricted, but no additional data is sent. Only BMW owners in some countries can subscribe to the service. BMW is working to try to broaden the availability, which depends on agreement of the local PSAPs (Public Service Answering Point) to receive notifications from BMW call centres. Clearly, the system relies on mobile network (GSM) coverage in order to be able to work. BMW Advanced eCall can roam and connect to any available network, unlike most personal mobile phones. While most of Europe is served by at least one network operator, there remain some areas where no connection is possible. Such areas are likely to be remote and poorly populated, precisely the sorts of areas where an automatic emergency call system could provide the greatest benefit. Many different crash test configurations, including European legislative requirements and Euro NCAP crash procedures, were used to ensure that the Advanced eCall hardware (sensors, control unit etc) were sufficiently robust to stand up to severe impacts and that the system detected the accident and notified the call centre. In all cases, the severity of the predicted injuries was noted for each of the tests. The efficiency of the system at connecting to an available network was established in areas where network coverage was known to be low. Call centre staff are routinely tested for their efficiency and knowledge to ensure that they can react appropriately in case of an emergency call.